If you had to compile a list of the twenty most important and / or influential people in the arts and culture scene in Nova Scotia over the past fifteen years, it would probably include Gregor Ash. Starting from his first arts gig as sales and promotion manager at CKDU radio in 1991 – 1992 through his various key roles in the music industry at the height of the Halifax Pop Explosion to his tenure at the Atlantic Film Festival, first as Operations Manager from 1996 until 2000 and then as the very forward-looking Executive Director of the Festival from 2000 until 2012, Gregor was on the front lines of what was a true Renaissance period for film and music in the province. He has also served as a member of the Nova Scotia Arts & Culture Partnership Council in 2010 – 2011, and as the Director of the Institute of Applied Creativity at NSCAD University from 2012 until 2014. 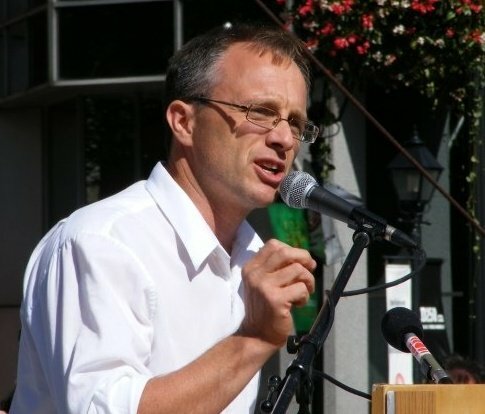 A two time candidate for elected office as a New Democrat (federally in 2011 and provincially in 2013), Gregor currently runs his own independent consultancy firm. I’ve known him since he was at the Film Festival and I was the Program Administrator at the Nova Scotia Film Development Corporation, and I’ve always had a great deal of respect for his commitment to the arts specifically, and public policy in general. He describes himself on Twitter as “a passionate servant of the Arts, a political junkie, a food lover and proud Newfoundlander, living a content life in the wonderful city of Halifax, Nova Scotia,” and I think that pegs him pretty much spot on. In an industry full of poseurs and provocateurs (and that applies to both the arts and politics), Gregor is genuine,passionate, and hard-working. I asked him a couple of weeks ago if he would be willing to sit down and discuss his career in the arts and politics to date, and he readily agreed. We finally managed to sync our schedules for Friday afternoon, the 26th of February, and we got together at the Second Cup in the Killam Library at Dalhousie for a wide-ranging conversation about arts, culture, the creative economy, and politics. We had actually been chatting for about twenty minutes – and both of us had been airing our opinions freely – when I finally said to him that I was going to turn my tape recorder on and start the interview. He looked a bit surprised and said that he thought I had begun recording at the beginning. I replied that I would never record anyone without letting them know, and that I thought perhaps what we were talking about might be things that he wouldn’t want on the record. Here is the conversation that followed – Gregor Ash… unplugged.